She’s a rebel for sure, but don’t ask Coco Papy to narrow it down to just one cause. 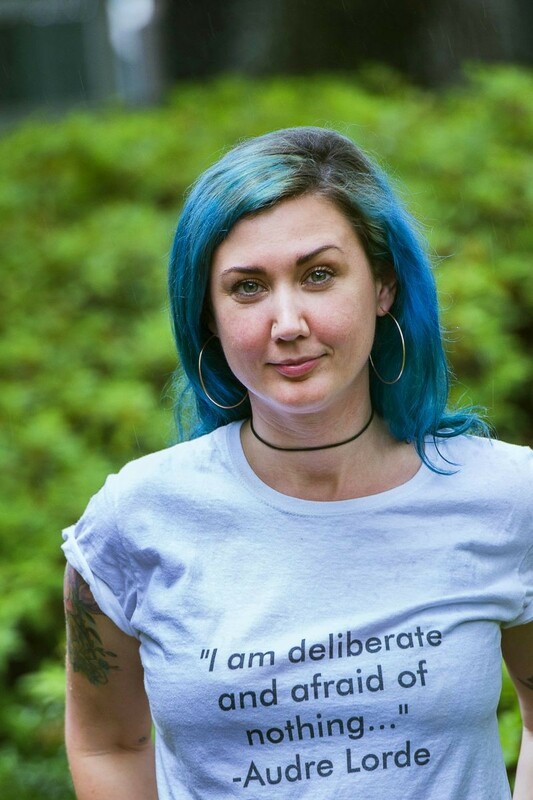 The co-founder of Emergent Savannah encourages participation in local civic life, champions reproductive rights as a co-chair of Planned Parenthood’s young professionals group, serves as a commissioner at the Dept. of Cultural Affairs and is part of Georgia WIN List’s current leadership class. The highly active activist wielded bus schedules and a bullhorn as a state organizer for the Women’s March on Washington in January, leading over 300 Savannahians to DC to participate in the historic event that has spurred so many into action. The next week she moved the crowd at Trinity Church to tears introducing participants who told their stories. Even on the days she isn’t at a meeting or organizing an event, the tireless, teal-haired advocate updates social media with petitions to sign and pertinent articles to read, gently reminding that if justice is to prevail, we’ve got to stay woke. Her refusal to accept the status quo began at Jenkins High, where she observed the schism of how some students were treated as opposed to others. Later she directed the fire in her belly to Food Not Bombs and other anti-war efforts, joining demonstrators when the world’s capitalist leaders gathered at Sea Island for the G8 Summit in 2004. Her artistic gifts led her to the School of Visual Arts in New York for college, but she fell in with a crowd of like-minded social justice warriors instead. After a few years of writing impassioned articles and working at an afterschool program in Harlem, however, she was approaching burnout. She spent her first few months back in town gauging the activism waters and identifying who was doing “The Work” of leveling the playing field for all, which naturally brought her into a room with Citizen Advocacy’s Tom Kohler, joined by the thoughtful millennials who would eventually become the Emergent Savannah crew. The group recently returned from Detroit, where they toured the Motor City’s devastated public spaces and studied the resilience of its grassroots communities. “What’s stuck with me from the trip was how people truly take care of each other there,” muses Coco. As much as it seems like she never sleeps, Coco is also an avid proponent of self-care, taking retreats and respites as she can. Of course, they tend to have an activist bent. As a Greensboro Justice Fellow, she has been invited on several occasions to attend workshops at the Highlander Research and Education Center, the historic social justice leadership training school in Tennessee where many of the seeds of organized labor and racial equality took root. “People think the Civil Rights movement suddenly came about in the 1950s, and I’m like, nah, bruh, it started at Highlander in 1934,” she says with a smile. She’s breezily self-deprecating about being recognized for her activism efforts, deferring to the many other anonymous people in town who keep their shoulders firmly against the boulder of the Sisyphean task of influencing policy and organizing “the Work.” While each of us may champion a particular passion, she reasons, only collectively will the push for change succeed. “Social justice, reproductive rights, racial equality—they aren’t really separate,” considers Coco.